RACHEL Anne Daquis reinforced Philippine Army’s reputation as home to top volleyball talent after being named the Most Valuable Player of the Shakey’s V-League Season 11 Open Conference on Thursday. Daquis became the fifth Lady Trooper to bag the coveted individual award after Ging Balse, Michelle Carolino, Nene Bautista, and Jovelyn Gonzaga during brief ceremonies held at The Arena in San Juan. The former Far Eastern University stalwart was also named the Best Server of the tournament. 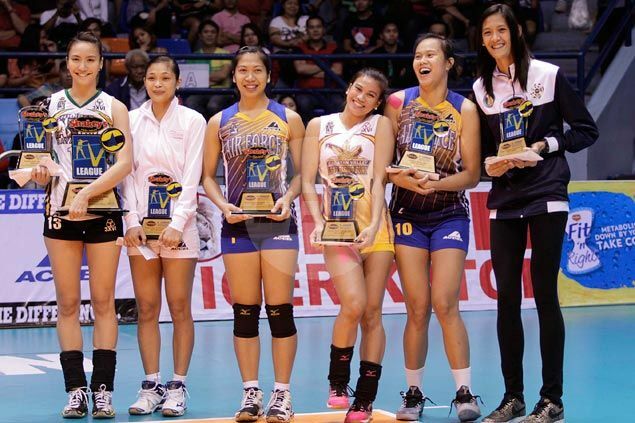 "Siyempre masaya ako sa MVP, pero ang ini-aim ko na award ay ang championship," said the lovely volleybelle. "Blessing ang MVP, pero pinaka-importante ang team." "Nagpapasalamat ako sa kanya kasi kahit hindi siya sundalo binibigay niya ang full support niya," said Philippine Army coach Rico de Guzman of Daquis. "Pusong Army na siya, doon na siya (barracks) kumakain, natutulog. Seven years na siya sa amin." Ateneo star Alyssa Valdez was named the Best Scorer, while UAAP Rookie of the Year Jaja Santiago of National University was awarded the Best Spiker. Maikka Ortiz and Rhea Dimaculangan of the Philippine Air Force were the Best Blocker and Best Setter, respectively, Bhebs Pineda of defending champion Cagayan Valley was the Best Digger, and Lizlee Ann Gata-Pantone was the Best Receiver.